This is a feature that allows car-and-dog owners to set a cabin temperature for their dogs’ comfort while they go off and … do whatever it is people do while leaving their dogs in the car. The car’s heating or cooling system will maintain the appropriate temperature automatically. Here’s the cool part: The Tesla’s screen shows a message meant to reassure worried passers-by that the dogs are OK. It reads “My owner will be back soon” and displays the interior temperature in large numerals. The main hitch I see is that the screen, which is usually used for the car to communicate with the driver, is positioned between the front seats. People passing by and noticing dogs in a closed car in extreme heat (or cold) may not peek in at the right angle to see the screen. They might still panic, break a window, call the cops, leave a nasty note for the owners, alert the security at the nearest store, etc. However, this does raise a great possibility: An add-on product that could maintain a reasonable temperature in the car while displaying a prominent notice easily visible from the car’s driver and passenger windows. A solar-powered cooler that hangs inside the window perhaps? Any inventors out there? That’s a Kickstarter I could get on board with. 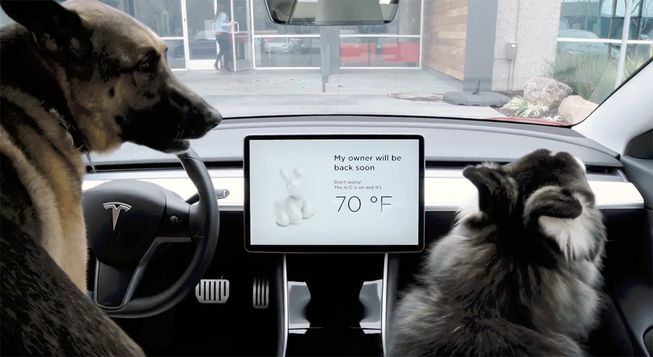 Well– If you did have a Tesla with this temperature control feature, I suppose you could use a pencil and paper to alert people to the fact that your dog(s) is(are) fine because the air conditioner is running and the temperature will not go about 65 degrees (or whatever.) Or one could even print out a lovely sign designed on your computer that could be so wonderful that no one could miss it. These signs could even have your phone number on it if people felt the need to let you know that they were concerned about your dog. THE AIR CONDITIONER IS ON! DO NOT BREAK MY WINDOW. Somebody told me they got a car thermometer that sends an alert to their phone when the car gets above a certain temperature. I looked it up, but it requires wifi, which, you know, most people don’t have wifi in their cars. I’d love to see a product like you mention above. In the mean time, if one were only leaving their dog in the car for a couple of minutes, perhaps a window cover and a battery powered fan would suffice?